We have collected and analysed 16 expert reviews and 215 user reviews from international sources. Experts rate this product 88/100 and users rate it 94/100. The average review date is 19-05-2017. We have compared these reviews to 367686 reviews from other Camcorders. The alaScore™ for this product is 98/100 = Excellent. Last update: 18-04-2019. And don't forget the awesome voice controls and waterproof designs. 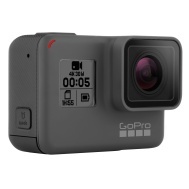 GoPro's latest Hero 5 action cameras up the ante with new waterproof designs, voice controls and software that'll help you create video memories easier and faster.